A lot of new faces are coming to the table at the North Pacific Fishery Management Council, and not a lot of them are happy about it. Fishermen who had never previously been involved with the council now have to show up to have a hand in how their fisheries will be incorporated into a federal fishery management plan, or FMP. The council, which regulates federal fisheries off the coast of Alaska, on April 6 started in on the topic of the salmon plan for Cook Inlet, part of the Alaska Peninsula and part of Prince William Sound near Cordova. After removing the three areas from the plan by amendment in 2011, effectively exempting them from federal oversight and delegating entirely to the state despite occurring partially in federal waters, the U.S. Ninth Circuit Court of Appeals ruled that the move was illegal. Now, the council is having to initiate the process of revising the salmon FMP to include the three areas, which is likely to take years. The State of Alaska is appealing the decision with a petition to the Supreme Court, but the court has not decided whether to take up the case yet. At the April 6 meeting, the council — which didn’t agree with the court’s decision but has to start addressing it anyway — got into the complex questions the plan will have to answer. The council didn’t make an attempt to answer any of the questions at the meeting April 6, but passed a motion solidifying the preliminary purpose and need, a number of alternatives and forming a stakeholder workgroup, which would decide its scope and agenda at future meetings. The motion will require council staff to focus on those questions to bring a more thorough analysis back to the council. The stakeholder committee, or committees, will not be formed until after the council gets its next review of the topic. One of the first hurdles is that the council doesn’t usually regulate directed salmon fisheries. 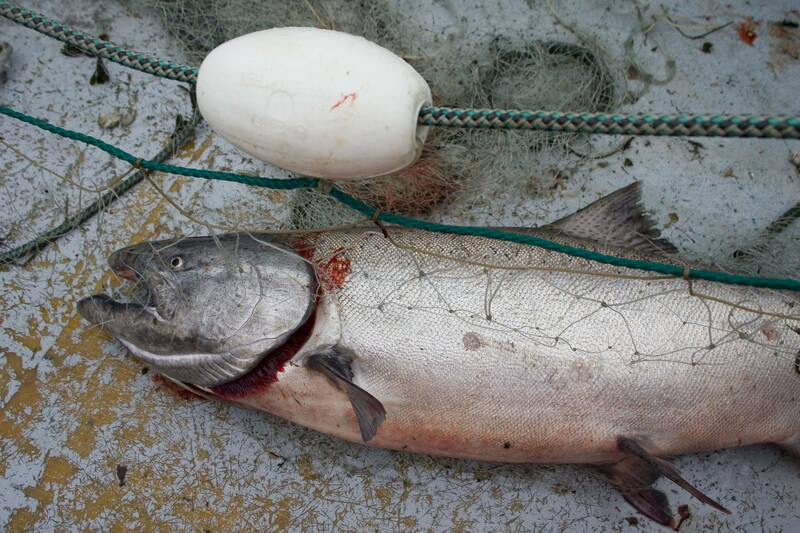 As anadromous fish, most salmon are harvested within three nautical miles of shore in terminal fisheries, which are in the state’s jurisdiction. However, under the Magnuson-Stevens Act, the council is required to manage harvested species throughout their ranges. For salmon, that would include state waters and potentially in-river fisheries, where essential salmon habitat is found. The council wrangled with the question of whether they could preempt state management, which is provided for in law, at the meeting April 6. National Oceanic and Atmospheric Administration legal counsel Lauren Smoker clarified that legal precedent says the council wouldn’t be able to preempt state management in internal waters, which puts in-river management off limits. The state waters near shore, though, may be a different story. Another part of the conundrum is setting criteria for overfishing. The Magnuson-Stevens Act requires the council to set accountability measures to meet the 10 sustainability criteria that are set out in the law, but the parameters of those are based on species and subject to evaluation by NOAA. For salmon stocks, management is based on the state’s analysis and setting of escapement goals, which are in-river and based on state data. The United Cook Inlet Drift Association, the trade group that sued to have the amendment removing the net areas overturned, argued that the state was not meeting Magnuson-Stevens Act sustainability criteria and needed to be held to federal oversight at the North Pacific Fishery Management Council level. In its comments submitted before the meeting, UCIDA said it was not opposed to the state’s escapement goal management, and state day-to-day management of openings and closures may be more effective than federal management, which can be slower. UCIDA Vice President Erik Huebsch said the group wants to see the state held accountable to the sustainability criteria and the fishermen get the opportunity to harvest surplus salmon in Cook Inlet to prevent overescapement. Cook Inlet’s fisheries are a tug-of-war when they come up before the state’s Board of Fisheries. In late February and early March, stakeholdes and the board met for 14 days to hash out regulations for the area’s sport, personal use and commercial fisheries, with hundreds of comments and sometimes hours of discussion on a single topic. Ricky Gease, the executive director of the Kenai River Sportfishing Association, asked the council to consider the effects on in-river sport and personal use fishermen, who sustain a massive sportfishing and tourism industry in Southcentral Alaska. He said the group supported the council deferring as much management to the state as possible and suggested restrictions like limiting the number of openings in the federal waters and a genetic project on sockeye salmon harvested in federal waters to protect depressed Northern Cook Inlet stocks. “Though this salmon FMP will impact three areas, Cook Inlet definitely has some unique features to it, and it’s the most complex management system for salmon in the state,” he said. Two groups representing the fishermen in the other two districts affected by the lawsuit openly said they had been fine with state management and didn’t want to be involved — Concerned Area M Fishermen and the Cordova District Fishermen United. Huebsch said UCIDA didn’t want the other groups to have to be dragged into it, either, but it was part of the process. The Concerned Area M Fishermen are catching up with the process now that they’ve been pulled into it, but don’t want much to change, said Steve Brown, the president of Concerned Area M Fishermen. “Our perspective is that the state is the proper management for the fishery,” he said. Federal management comes with other requirements such as vessel observers, who watch commercial fishery bycatch. Electronic monitoring systems for bycatch are in the works, but for now, most observers are still people stationed on boats. Huebsch said the Cook Inlet fishery had had observers before and could accommodate them, but the Prince William Sound fishermen would be very inconvenienced, said Jerry McCune, the president of Cordova District Fishermen United.